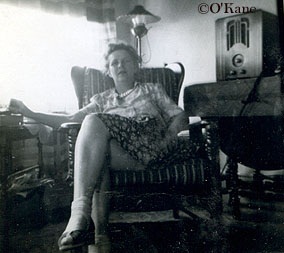 Pete O'Kane, his mother Delphine and stepfather Frank Quinn lived in a little house on the beach at the end of Whittier. 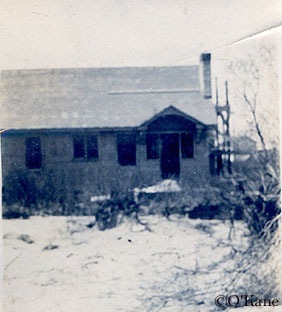 The first photo to the left was taken while the house was being built, around 1926.The two photos below are from the early 1940s. 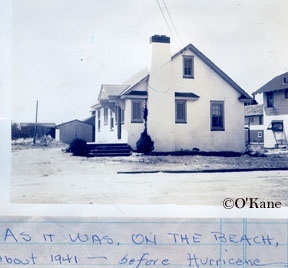 The door on the side faced the beach and the house to the right in these 2 photos is still standing at the very end of the street today. The area where their house once stood is now a dune. 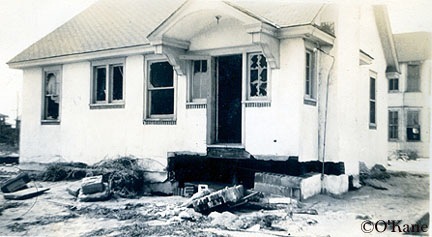 The next 3 photos are of the house the day after the hurricane of 1944. 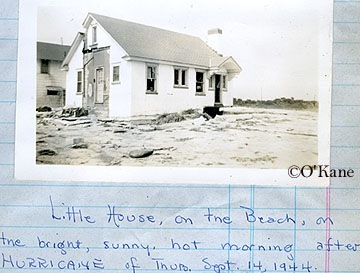 After the hurricane, the little house on the beach was moved to Commonwealth, near Vincent. 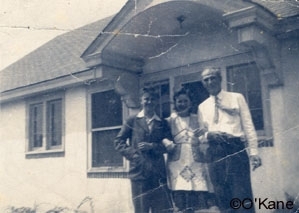 Below are some 1946 photos of the house in its new place. 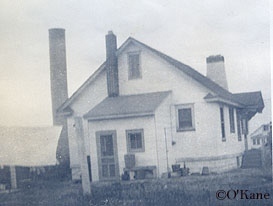 Years later, the house was bought by the Riordans, who raised their kids there. 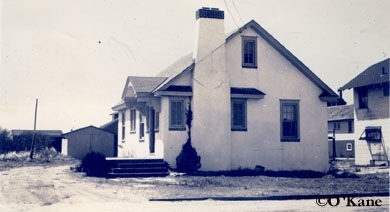 The house has since been added onto and now houses Riordan Realty. 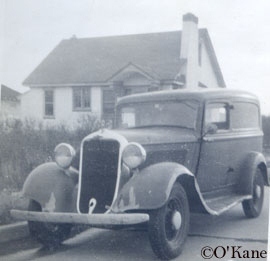 Below is the family car in front of the house, with the recognizable archway over the door on the side. Next is the O'Kane/Quinn Family on Easter. 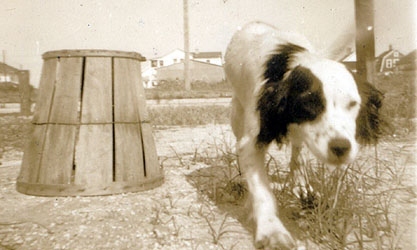 The last photo is Delphine inside of the little house when it was still out on the beach in 1943. Delphine on the railing in front of the house on Commonwealth. You can see a bit of the old water tower on the left side of the photo. 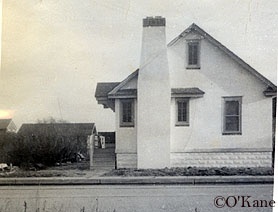 Some street views from Commonwealth around 1946. 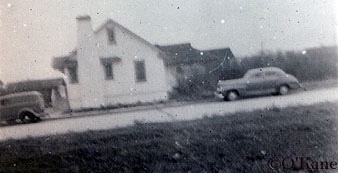 The first photo shows a house being built on Webster with the boathouse barely visible in the background in the very center of the photo. 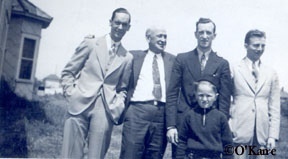 The men of the family in 1938 - Bob Spiecker, George McCullough, Joe McFadden, Ken Weaver Sr. and Pete O'Kane in the front. 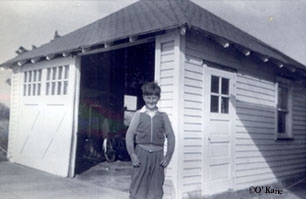 Pete in front of the McCullough garage on Commonwealth, 1938. 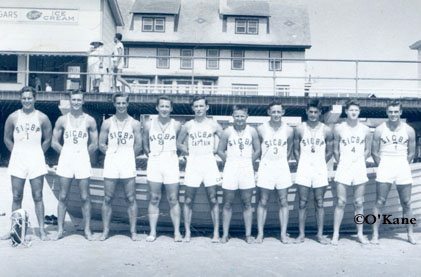 Here is a young Pete in front of the Williams house which used to stand beachfront at the end of Sherman. 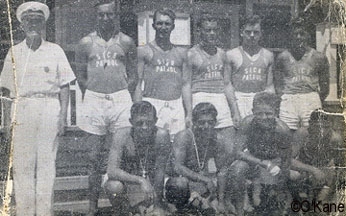 The house was built by Gilbert Smith and was all concrete with a large mosaic of an Indian head on the beachfront outside wall. 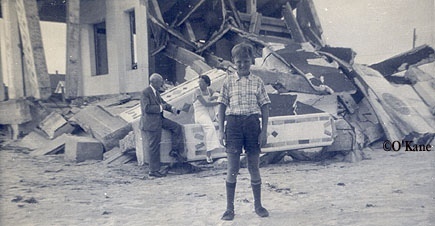 After the house collapsed on the beach, children would play in the ruins for many years, and it became known as the 'Indian Rocks'. 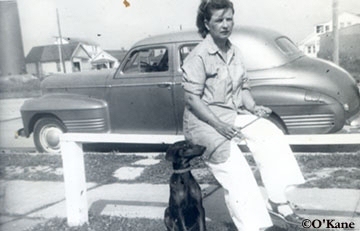 In the background is Pete's grandfather George McCullough and Al's wife Betty McCullough. 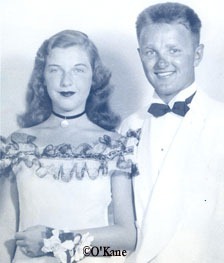 Below is Pete O'Kane and his prom date Betty Collins in the 1940s. 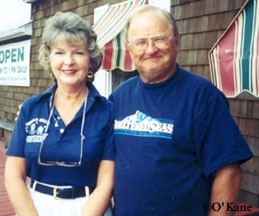 The 2nd photo shows Pete & Betty reunited over 50 years later in Strathmere outside of Uncle Bill's Pancake House in 2004.